I only spoke with Gladys Murray a handful of times, mostly at the Eliada Orphanage reunions. I knew that she supported my oral history project, but I never convinced her to sit down for an interview. Her orphanage sisters told me that she was private, and Gladys knew that if she spoke with me I would ask her about Ruby, her younger sister. Ruby had murdered her husband in cold blood and then drowned herself and her eight-month-old son Timothy in Lake Junaluska, North Carolina one Sunday morning in the fall of 1962. What happened on that tragic day would clearly not be a topic that was open for discussion. 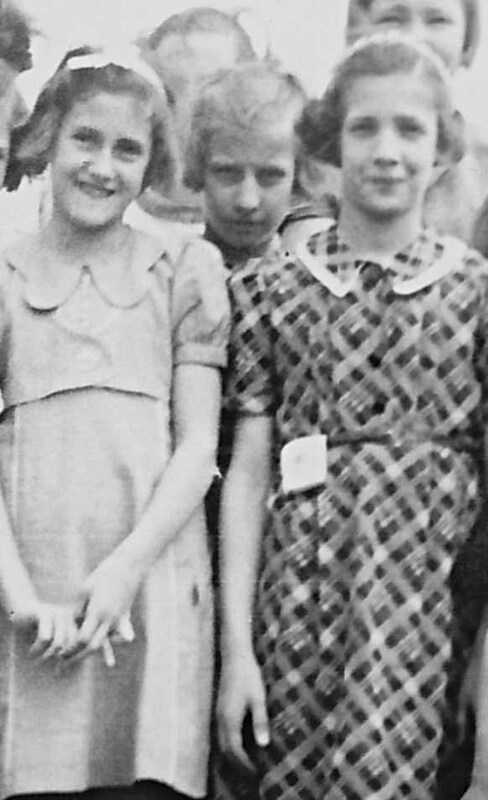 None of Ruby’s orphanage sisters would talk about the events that day–only that she had been a quiet girl while growing up at Eliada during the 1940’s. Some of them spoke about an undiagnosed mental illness, others quietly hinted at marital discord, but no one knew for sure. Luckily, I had found several photographs of her in the orphanage archives. 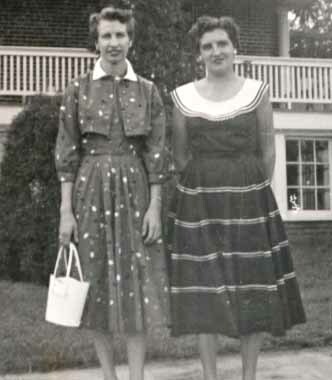 One showed Ruby as a teenager in a floral dress, posing with her other sisters in front of Old Main, smiling brightly for the photographer’s camera. A double murder and suicide in a Haywood County family shattered the morning calm in this quiet mountain community early Sunday. Haywood County Sheriff’s Deputy Gene McCracken answered a call to the home of Lawrence Fullbright, 36, in the Ninevah section near Waynesville and found Fullbright dead about 7:30 a.m., shot in the head with a .22 caliber rifle. His wife, Mrs. Ruby (Cogburn) Fullbright, 32 years old, and their eight-month-old son Timothy, were found about 11:30 a.m. drowned under the dam bridge at Lake Junaluska. Officers said the mother and child were found tied together with a rope. Notes written by Mrs. Fullbright were discovered in a purse found in the home. Burial instructions were included in the notes, but Sheriff’s Dept. spokesmen declined to say whether the instructions covered the husband and son. The deaths were ruled a double murder and suicide by the coroner, Dr. George Brown, following an investigation. Mrs. Fullbright, described as being distraught in recent weeks, entered her husband’s bedroom about 7 a.m. and shot him in the back of the head as he slept. She then locked the bedroom door and took the rifle, the empty cartridges, and two more live shells, and put them behind the kitchen door. Mrs. Fullbright then called her brother-in-law, Sam Fitzgerald, and told him that her ten-year-old daughter, Diane, was ill and asked him if he would come to the Fullbright house and see about her. She told Fitzgerald she had to leave the house for a short time. When Fitzgerald arrived at the house, he found the daughter asleep and unharmed in her room. He woke her up and they picked the lock to the bedroom. Sheriff’s deputies were called on discovery of the body, and officers put out an alert to apprehend Mrs. Fullbright, who was driving a 1953 model car. Ruby Cogburn (standing third from right) with her Eliada sisters in front of the Main Administration Building. Local law enforcement agencies participating in the search included Waynesville City Police, Sheriff’s Department, the State Highway Patrol, and the State Bureau of Investigation. Haywood County Sheriff Frank Medford found the car at the end of the Lake Junaluska bridge and immediately called in the Haywood County Rescue Squad with diving equipment. As the divers entered the lake in boats they saw the mother and son’s bodies floating under the bridge, tied together with rope. Officers theorized that Mrs. Fullbright meant to use the other two shells found in the kitchen on herself and the child, but changed her mind and drove to the lake. The weapon had been borrowed from a neighbor by Mrs. Fullbright earlier in the week. She told the neighbor her husband wanted the rifle to shoot birds with. The Sheriff’s Department stated that in recent weeks Mrs. Fullbright had mentioned suicide around neighbors and relatives. She had been depressed recently because of ill health and had been under the care of a physician. Joint funeral services for the three will be held at 2 p.m. Tuesday in Crawford Funeral Home in Waynesville, with Rev. Claude Conard officiating. Burial will be in Hillcrest Memorial Gardens. Mrs. Fullbright, the former Miss Ruby Cogburn, was a daughter of the late Boyd Cogburn and Mrs. Jennie Burnett Cogburn of Haywood County. In addition to her daughter, she is survived by her two sisters—Mrs. Gladys Murray of Clyde, and Mrs. Agnes Holland of Canton. Fullbright was owner and operator of Lawrence’s Taxi Service in Waynesville and was a veteran of World War II. He was a member of the Waynesville American Legion Post. He was the son of the late Sam H. Fullbright, who died about two weeks ago, and Mrs. Nancy McDaniel Fullbright of Haywood County. This entry was posted in Inside Eliada Orphanage and tagged Eliada Orphanage, Gladys Murray, Lawrence Fullbright, Ruby Cogburn Fullbright. Bookmark the permalink. Cliff–When I talked to you the other night I told you I had read this. Well I see I had not until this very moment. Wow! Another great story. I didn’t know anything about this and had never heard about it either. But that shouldn’t be a suprise because back then everything was kept a secert. No wonder the poor girl shot her husband and killed herself, she had no one to share her feelings with. Back then you were taught to keep everything inside and don’t tell anyone. Thank you for sharing this story, it needed to be told. I agree with you–I don’t think we will ever find out what really happened. The general attitude towards mental illness has changed dramatically since then. You are right Cliff. Back then we were taught to keep every thing inside and not tell anyone about how you felt. Today we tell all, or at least most people do. I was just saying I felt so sorry for her that she felt she had no other choice. I have been close to that myself at times. Years ago, not now–life is good and I’m very content. I’m glad we can talk like this back and forth with each other. You are part of the family. I hope you know that. I have been haunted by this event for a long time. I was 5 years old when my dad was called to the scene. We arrived in his Jeep Willys Wagon. I stayed in the car with my one-year-old brother while he drove her car across the bridge for the police. I remember it was a two-toned green and yellow Chevy. My father told me small amounts of what happened, but it was explained in more detail by the older kids in my neighborhood. Dad was a young veterinarian in the area…I don’t know why he got involved, but it was a small, close knit community. Interesting to read this so many years later. Thanks Maye. I’m glad to be part of the family.